AUTHOR INFORMATION: Jedediah Berry’s short stories have appeared in in numerous journals and anthologies, including Best New American Voices and Best American Fantasy. He works as an assistant editor of Small Beer Press. “The Manual of Detection” is his first novel. ABOUT THE MANUAL OF DETECTION: In an unnamed city always slick with rain, Charles Unwin toils as a clerk at a huge, imperious detective agency. All he knows about solving mysteries comes from the reports he’s filed for the illustrious detective, Travis T. Sivart. When Sivart goes missing, Unwin is suddenly promoted to detective, a rank for which he lacks both the skills and the stomach. His only guidance comes from his new assistant—who would be perfect if she didn’t have a sleeping disorder—and from the pithy yet profound Manual of Detection. Unwin mounts his search for Sivart, but is soon framed for murder, pursued by goons and gunmen, and confounded by the infamous femme fatale Cleopatra Greenwood. Meanwhile, strange and troubling questions proliferate: Why does the mummy at the Municipal Museum have modern-day dental work? Where have all the city’s alarm clocks gone? Why is Unwin’s copy of the manual missing Chapter 18? CLASSIFICATION: According to the publisher, “The Manual of Detection will draw comparison to every work of imaginative fiction that ever blew a reader’s mind—from Carlos Ruiz Zafón to Jorge Luis Borges, from The Big Sleep to The Yiddish Policeman’s Union.” Myself, I was reminded of Jack O’Connell’s “The Resurrectionist”, Barth Anderson’s “The Magician and the Fool”, M. John Harrison’s “Nova Swing”, and Jon Courtenay Grimwood’s “End of the World Blues”; all surreal titles that mixed mystery or noir with fantasy/sf. The detective/noir elements though, are neither hard-boiled or Holmesian—the case titles and Detective Sivart’s archenemy brought to mind Sir Arthur Conan Doyle’s Sherlock—and possess more the playfulness of Jonathan Barnes’ “The Somnambulist”, while the fantasy aspect is of a magic realism nature. FORMAT/INFO: Page count is 320 pages divided over eighteen titled chapters, each of which is prefaced by a small excerpt from The Manual of Detection. Narration is in the third-person exclusively via the clerk who’s been promoted to detective, Charles Unwin. “The Manual of Detection” is self-contained, but leaves openings for a possible sequel and/or series. February 19, 2009 marks the North American Hardcover publication of “The Manual of Detection” via The Penguin Press. The UK version will be published March 5, 2009 by William Heinemann Ltd. 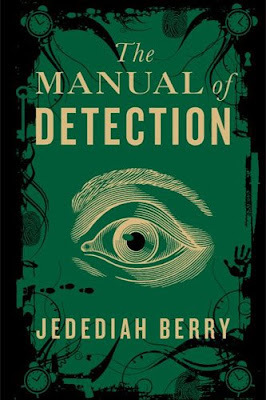 ANALYSIS: Jedediah Berry’s debut novel, “The Manual of Detection”, is every bit as odd and mind-expanding as the description makes it out to be. For starters, not only is the city in the book never named, neither is the time period, which immediately adds to the book’s surrealism. From the use of typewriters, phonographs, joints like the Forty Winks and the Cat & Tonic, femme fatales, and other noir-esque characteristics though, it’s easy to guess what era the author is emulating. The true measure of “The Manual of Detection’s” oddness and surrealism however, is through the book’s story and characters. Of the latter, virtually every single character that appears in “The Manual of Detection”, no matter how insignificant they may appear, are more than they seem and are distinguished by some unique attribute—Unwin’s new assistant, Emily Doppel, has a sleeping disorder; Edwin Moore, the museum attendant, uses a technique to make him forget things; the Rook twins haven’t slept in seventeen years; Enoch Hoffman is a biloquist with the ability to imitate thousands of voices; and so on. The central figure though, Charles Unwin, is the most eccentric of them all. A clerk of the Agency, Charles has been filing reports on the cases of Detective Travis T. Sivart for the “last twenty years, seven months and some-odd days” and is marked by the bicycle he rides everywhere, his umbrella, his green trilby hat, and being a “meticulous dreamer.” As interesting as the characters are though, there’s really not that much depth to them beyond their superficial quirks, and I never came to a point where I actually cared about any of them. Interjected throughout the plot meanwhile, is a ton of interesting background information that adds to the overarching mystery, including details on Detective Sivart’s cases The Oldest Murdered Man, The Three Deaths of Colonel Baker, and The Man Who Stole November Twelfth; Cleopatra Greenwood, Enoch Hoffman, Jasper & Josiah Rook, Colonel Sherbrooke Baker, and Caligari’s Travels-No-More Carnival. On Corpses: Many cases begin with one—this can be disconcerting, but at least you know where you stand. Worse is the corpse that appears partway into your investigation, complicating everything. Best to proceed, therefore, with the vigilance of one who assumes that a corpse is always around the next corner. That way it is less likely to be your own. At other times, the writing is plain and workmanlike—“He rode south through the city, his umbrella open in front of him. He ignored the blare of horns and the shouts of drivers as he wove through the midday traffic, keeping his head tucked low.”—resulting in an uneven reading experience that could have been much more enjoyable if the author had been able to maintain the same level of cleverness throughout. Your good review convinced me to put this book immediately on my list. I have a foible for odd stories. Thanks, sound just up my street! I had the same feeling too - sounded promising but was very dry and uninteresting.